Read the latest news of the partnership between the Infosys Foundation and Akshaya Patra. Through this fulfilling relationship lasting over a decade, the two organisations have succeeded in having a positive impact in the fight against childhood hunger. Akshaya Patra featured as part of an episodic show 'Innovating for a Better Tomorrow' presented by Infosys and CNN-IBN, where 14 select innovations were showcased. At the award ceremonies where the pioneers of these innovations were felicitated, Akshaya Patra was awarded for its contributions in making a positive impact on over a million lives in India. N.R. Narayana Murthy, Founder of Infosys Limited, and other dignitaries presented the awards. The Infosys Foundation donated Rs. 127 crore to Akshaya Patra to assist the organisation in building and operating three new modern kitchens, with an additional corpus amount of Rs. 20 crore. The contribution by the Infosys Foundation was ear marked to set up a kitchen in Jodhpur (which began operations in August 2013), and a kitchen in Hyderabad as well. Sudha Murty, Chairperson of the Infosys Foundation flagged off the clean drinking water project for Government school children in Jaipur. The project provides clean drinking water to over 50,000 children across 203 schools, while the next phase to be rolled out will cover 50,000 more. The students and teachers expressed their gratitude for this initiative of providing clean drinking water, as it solved a problem they had been facing for some time. Akshaya Patra Chairman Madhu Pandit Dasa spoke as part of a panel featuring Narayana Murthy Founder of Infosys Limited and Jeffrey L Bradach of The Bridgespan Group, moderated by Kasturi Rangan of Harvard Business School, USA, at the Development Dialogue 2015. The theme for the event was 'Scaling by Proving' which stressed that the route to successful scalability lies in careful planning and execution in the early planning phase. Narayana Murthy Founder of Infosys Limited, along with Sudha Murty Chairperson of the Infosys Foundation, officially released the soundtrack 'Ode to a Billion' composed by Javed Akhtar and sung by Shankar Mahadevan. The track was released in August 2012 to commemorate the occasion of Akshaya Patra serving its billionth meal. During an interview on NDTV Profit Narayana Murthy, Founder of Infosys Limited references Akshaya Patra as a perfect example of a Public-Private Partnership model. In 2011 Narayana Murthy discussed compassionate capitalism at an event organised by The Akshaya Patra Foundation. Sharing his own experiences with hunger growing up, he also explained the need for inclusive growth where the fortunate members of society take responsibility for ensuring that hungry children are fed. The Infosys Foundation stepped up to the plate once again to support underserved children across India. 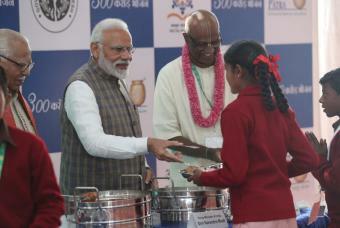 This time the organisation contributed 450 computers to schools in 11 Mandals across Medak, Hyderabad where Akshaya Patra serves the mid-day meal programme. Through this initiative each school has been equipped with a computer, and approximately 60,000 students will benefit from it.